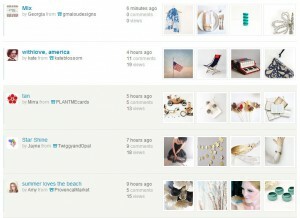 TreasuryBox, my free tool for treasury-making on Etsy, has been used to make over 200,000 treasuries. I’ve been humbled by the response and proud that so many people find it fun and easy to use. My priority with TreasuryBox is to make picking items and visualizing your treasury fast and easy – but it also has some other time-saving features. Increase your treasury-making speed with the 5 tips below! Sending convos to shops featured in your treasury is a hot topic. Some curators feel that convos are unnecessary, since treasury activity shows up on the Etsy activity feed; just as many argue that things are easily lost or ignored in their activity feed, and they appreciate a convo. If you decide to send convos, TreasuryBox can save a huge amount of time by notifying all 16 featured shops in two clicks. Simply save the treasury, then click “Send Notifications” in the curator tools on the right side of the page. Enter a subject and message to send to all the featured shops – TreasuryBox will automatically include a link to that seller’s featured item and a link to the treasury. Click Send and watch the convos fly! The subject and message you enter will be saved to send notifications even faster next time. The Send Notifications window also has an option to skip notifications for the bottom row. Treasuries that make it to Etsy’s front page only show the first three rows of items; the items in the bottom row are hidden as alternates and pop in if one of the first 12 items sells. Curators who want to notify the prominently-featured sellers but don’t want to bother those in the alternate spots can use this option to have their cake and eat it too! 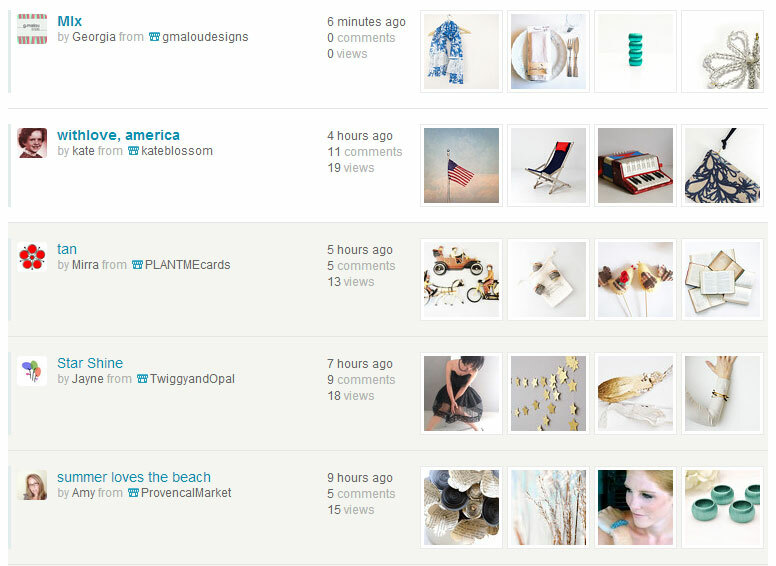 The only thing better than creating treasuries is having your own items featured in treasuries! 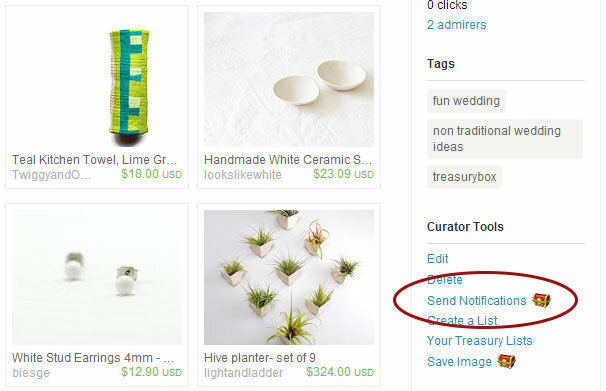 TreasuryBox makes it easy to see all the treasuries with your items by adding a “Lists Featuring You” link on Etsy’s treasury page. It’s never been faster to keep up with treasuries that have featured you – even without a convo notification. To make life even easier, TreasuryBox will dim treasuries on the “Lists Featuring You” page that you’ve already looked at. No need to re-open treasuries to see if you’ve replied. Treasury teams are a great way to promote your items on Etsy, but making sure that your treasuries include team members can be a real time sink. TreasuryBox has an optional feature called item markers that allow you to mark items with one of three colors while you’re creating the treasury. Mark your team members so you make sure to put their items in the top spots – keep track of items from multiple teams with different colors. To turn on item markers, click the cog in the upper-right of the treasury window and check the box that says “Show item markers”. Add items to your treasury and click the empty white dots next to the item link to assign a color. Item markers don’t have to be used to mark teammates – some curators use them to mark item price points or themes to ensure a balanced treasury. 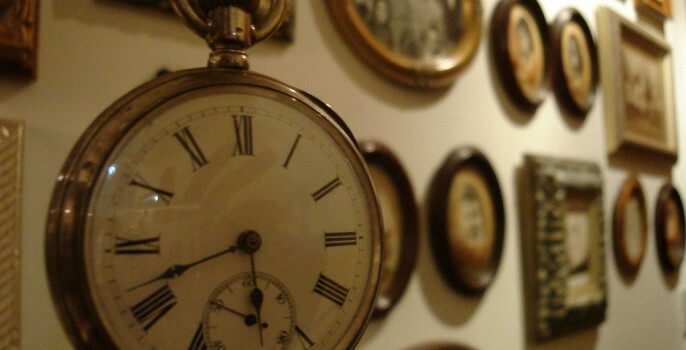 Posting treasuries to Facebook, Pinterest or Instagram never quite works out. Social media sites pull the first image, or allow you to pick one, rather than capturing the whole treasury as it was artistically arranged. Taking a screenshot is tedious and frustrating. 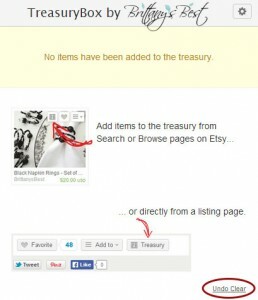 TreasuryBox solves this problem once and for all by adding a “Save Image” link to every treasury on Etsy. Put down the snipping tool and save your Print Screen button – now you can save an image of a treasury you created, or one you were featured in, with one click. Post it, add a link to the treasury, and you’re done! TreasuryBox was born out of frustration after losing one too many treasuries on Etsy. 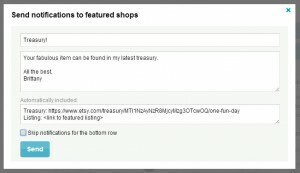 It’s just too easy to navigate away from the treasury creation page and lose all your work – and the “Add item to treasury” button that Etsy provides makes a private treasury that loses its freshness while you’re building it. To make sure that you never lose a treasury on accident, TreasuryBox not only saves your treasury across browser sessions and computer reboots – it can also restore a treasury if you accidentally hit the “Clear” button. After clicking “Clear”, open the TreasuryBox popup window and look in the lower right for a subtle – but possibly delightful – “Undo Clear” link. Click it to restore the last treasury you were working on. If you haven’t tried it before, install TreasuryBox and give it a whirl today. You may just find yourself addicted to making treasuries again! Sign up for my email newsletter to keep in tune with the latest TreasuryBox news. What’s your favorite TreasuryBox feature? Cover image by Fabíola Medeiros on Flickr. Thank you, thank you, THANK you for the TreasuryBox tool. My Team Captain clued me in on it – I love making treasuries and have just now signed up for your newsletter, as well. After reading this article, I must start using the color coding feature. However my biggest take-away from this article is the Save Image feature explanation. I cannot wait to begin using that – it will be a blessing, teamed with the treasury link, on my blog, on FB and anywhere else I travel online. Will you ever be making a version for Firefox? I only use Google Chrome for the treasury building but it is a finger-saver and a time-saver. I immediately fell in love with the notifications-all-in-one-click aspect. Oh, well, I love everything about it! Thanks for the kind words, Evelyn! I’m tickled whenever TreasuryBox is recommended to others. Unfortunately, I don’t have any plans for a Firefox version. Zeesi, you can edit an image pin after uploading to set the link – here’s a video showing how it’s done. Do you have an app or extension for iOS ? John, I haven’t made a version for iOS – but another developer made Treasury Maker for iOS that might suit your needs. Some notifications failed to send. The failed listings are shown in red. all of the listings were highlighted in red, so I’m assuming that none were sent…..a glitch that has to do with etsy? Linda, thanks for letting me know! 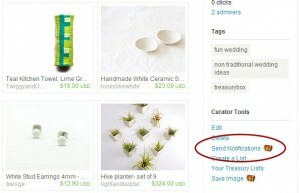 Etsy has re-enabled the new convos for some sellers; I’ve released version 1.6.8 that fixes TreasuryBox’s notifications with the new convo system. Chrome will update TreasuryBox automatically – you can check the version by going to the Chrome menu > Tools > Extensions. Hi Brittany, I just created a treasury and I deleted one of the items. I wish to replace it with another one but I cannot remember how. I know it can be done as I have done this before. Thanks a lot Brittany. Deirdre, the easiest way is to click “Add item to treasury” from the bottom of the listing page for the replacement item. You can also go to the treasury on Etsy and click “Edit” in the Curator Tools – then paste the URL for an item into the empty box and save. Thanks Brittany, I got it! I just love treasury Box. In fact I am becoming addicted to making treasuries since I discovered it. Lately, however. I find I am unable to send notifications, which was a wonderful feature. I did read in your ‘responses’ above how to fix this but I cannot find it now. Thanks for your answer. Deirdre, I’ve updated TreasuryBox with a new version 1.6.3 that should fix the convo sender. Chrome will update automatically in a few hours, or you can update manually – let me know if that fixes it! This is a great tool! Really stable and easy to use…I am hooked! Thank you! I have a couple dreams/desires which are most likely already in the works…first that it would be possible have more than one treasury under-construction at the same time…and the second, that I could give a treasury a title while in it’s draft stages. Cinne, thanks for your kind words and for the input! We’re always looking for ways to improve TreasuryBox – this helps. I love treasury box and use it every time I make one. It’s just so easy and convenient. I didn’t know a couple of fact told about here, so thanks so much for everything! Sue, hope you are now able to use all the features. Thank you! Yes…I am one of those so very thankful for your innovative and thoughtfully created treasury making tool, Brittany. I thought I knew all it could do…but, this article gave me even more of the great offerings available…thanks. I especially love the save image option. Hooray and thank you!! Great tips! Thank you Brittany! I love treasury box and used it yesterday for several things, getting to love it even more..today the icon is gone and Chrome tells me that it is installed…where did it go?? Mary, I suspect Chrome may have inadvertently hidden the icon. Move your mouse just to the right of the address bar in Chrome so your cursor is a horizontal resize arrow like < -->, then click and drag to the left. See if the TreasuryBox icon reappears that way!